In today’s world, you can sign up for any number of classes for an infinite range of knowledge and skills. You can earn a degree in just about anything you can dream up. But there is something missing from the way the majority of leaders and perhaps even parents operate. Apprenticeship is the term we use for the other end of a mentoring relationship. Apprenticeship was the ancient means of on-the-job training: a young boy would move out of his father’s house to live with a skilled craftsman (his mentor), and, after many years of careful, specified training, he would be ready to take over the business when his mentor died. Obviously, job training has changed quite a bit since then. The mentor/apprentice relationship is so rare these days. Why is that? I think the answer is simple: mentorship is hard. It takes work. It takes time. It takes relationship – which means many levels of work – good communication, responsibility, emotional integrity, just to name a few. Not easy stuff for anyone! Pretty groundbreaking, right? Chew on that for a minute. Your job as a leader is to create a FOCUS for your mentees. And of course, you can’t do this effectively without your OWN focus being even more honed in! Why? Because the apprentice mirrors the mentor. Mentorship is not an “I’m better than you” relationship. This isn’t a power trip. The best mentorships work when you offer your support in any way possible…you truly want to offer the person you are mentoring the very best of yourself. Mentorship is NOT “my way or the highway.” Last I checked, dictatorships didn’t work very well 😉 and humility is one of the most important virtues a person can embody. One personal example comes to mind. I have begun to mentor two UpLevel team members. As I started the process of investing in their lives, I realized that one of them should really be a mentor to the other one instead of myself. While I always make myself available to mentor people on the UpLevel team, this particular team member has more resources and time to offer that I do not. In addition, him being a mentor actually helps him learn even more. Have you ever heard that saying ‘teach to learn’? Teaching completes the cycle of learning and is one of the best ways to learn. So, I had a decision – was I willing to put aside my need to “be the leader” and instead give space for something that would be more effective in the long run? After some thought and conversation, the team member decided that, he would join them at their schools one day a week to offer any experience he has to support them in their life and towards their success as well as begin to mentor them each Thursday starting at the beginning of 2018. He is stepping into the role of being their mentor and as his mentor I believe he will do great. Sometimes being a leader is knowing when to let someone else call the shots. Mentorship is not all about YOU – it is about the person you are mentoring. It’s about helping THEM to reach their best self in ALL areas of life. And for them to see you as their mentor – to truly learn from you – you must earn their respect. You must pursue a true and valuable relationship. You must be a leader for them. Mentorship is constant. It isn’t just a few meetings, checked off a list, in one-hour increments. It’s truly a way of life. Mentorship is a journey. It involves guidance along a path by someone who is further along the road than the person they are mentoring. Which means you need to stay one step ahead of those you are mentoring…they are always learning, so you must be too! Mentorship is a relationship. As I mentioned before, you as a mentor are becoming closely involved in the life of your apprentice, helping them become the best version of themselves. It is caring about them authentically and personally. And that means your role involves speaking into all areas of their lives, not just one specific area…because people are more than just one part, and they grow as a whole person – body, mind, soul, business, personal – everything is linked together. It has been said that ‘people don’t care how much you know until they know how much you care’. To make the largest impact you must care from the bottom of your heart about the success and wellbeing of your mentees and sometimes this means going out of your way to help them have a better life. Sometimes it helps me to think about helping those I am mentoring to have a better life than me. One way I do this is if I am having a conversation with a mentee and they are explaining ANY sort of challenge in their life I am listening from a standpoint of how I can help them solve that challenge or what I can do to make that part of their life easier. Mentorship is difficult. Too often, mentors struggle to challenge their mentees because they want to be viewed as friends – they don’t want to make them upset or make them feel uncomfortable. However, making them uncomfortable is an integral role of a mentor! At UpLevel Martial Arts, ‘Forging Leaders for life’ is our tagline. If you really think about it, ‘forging’ is not a comfortable process. The best mentors know how to build and maintain trust while finding the right ways to push and challenge their mentees in a way that propels them forward towards success. That takes wisdom, tact, and yes, sometimes the willingness to look like the “bad guy.” But, if you play your role well, they will thank you in the end. When I try to get you to do something for you – that is inspiration. When I try to get you to do something for me – that is manipulation. But when I try to get you to do something that benefits you and me – that is mentorship. 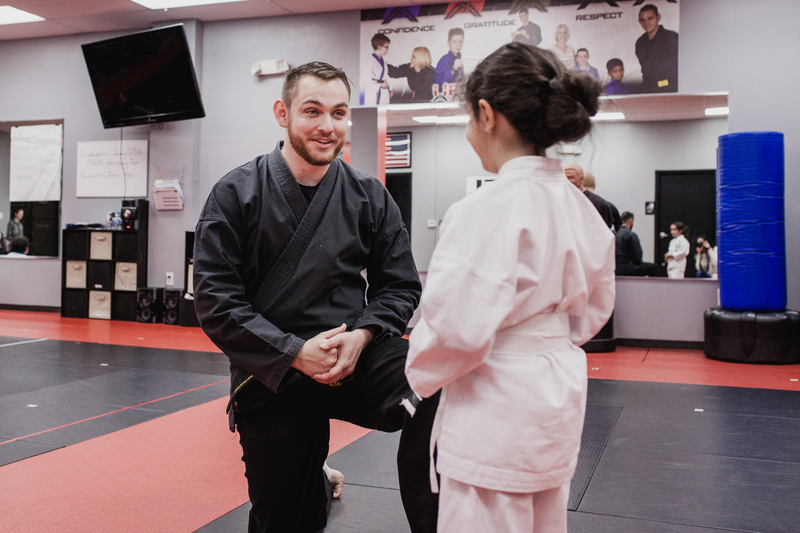 First, I want you to identify your own mentor in martial arts (or in any area of life) that is, either the person or persons who will help you along your path to earning your black belt at UpLevel martial arts. I truly believe mentoring is the best way to lead other people. And I believe it is the number one way we will continue to create success for ourselves and others. At first, mentorship may feel like you’re “not doing as much” as, say, an inspirational speaker in front of hundreds of people…but when you do the math, it adds up far more effectively! Think about it — If each of us as leaders made the goal to mentor 10 people, and each of those 10 became mentors to 10 more (because that is the direction you mentored them) and they mentored 10 more…pretty soon you have more people that you can count, each mentored personally and effectively by someone else who is directly invested in their well being. This is called exponential growth, and it is the wave of the future. Using this model, we could actually mentor millions of individuals! Pretty exciting, right? What is mentorship to you? Have a conversation with your family or friends. How can you become a better mentor to others? How can you increase your level of mentorship even more? What channels will you employ to make the practical, everyday mentorship steps a reality – will it be weekly calls or short trainings? Short and intensive or drawn out talks? Hands on? Hands off? How can you best help your “apprentice” towards a life of investing in others? Let’s get to work and mentor some people to black belt and beyond. We’ve got lots to do and we need your help!